One of the most important Action Zones to 3D Browsing is the Load Zone. What is a Load Zone? A Load Zone is an Action Zone that when you Walk inside the Load Zone, it triggers the loading of 3D Building Blocks. When you Walk outside the Load Zone, it triggers the unloading of 3D Blocks. Normal – Load when Near – Designed to be the Inner 3D Building Blocks or details for a 3D Object. The Normal Load Zones are large enough to encompass the entire 3D Object. By default, all 3D Building Blocks are in the Normal setting with the exception of the foundation. High – Load when Far – Designed to be Outer Walls or larger 3D Building Blocks seen from the outside of the 3D Object. High Zones are proportionally larger than the Normal Load Zone. Extreme Load Zone – Designed to be the 3D Building Blocks that you see at a far distance to know something is there so that you approach it to see more. It would be the most defining few outer 3D Building Blocks. Extreme Zones are usually over twice the size of High Load Zones. 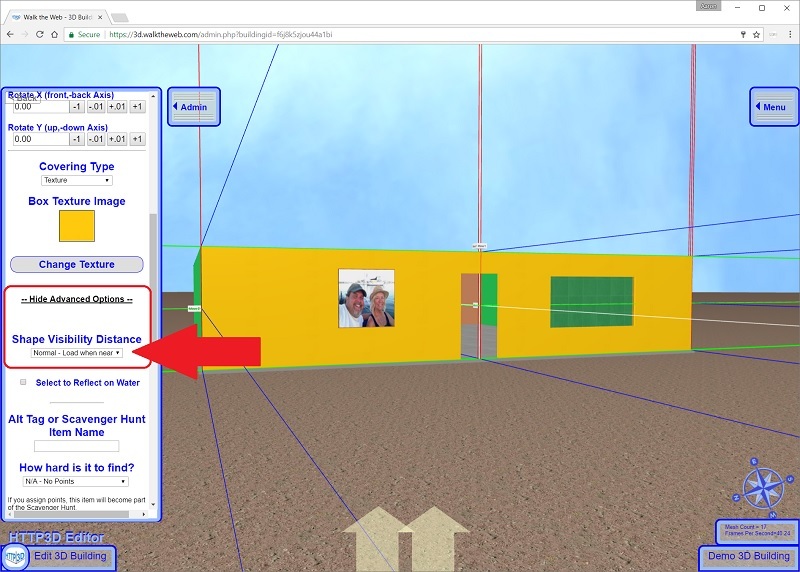 The Load Zone can be set in the Edit Settings – Advanced Options of a 3D Building Block. 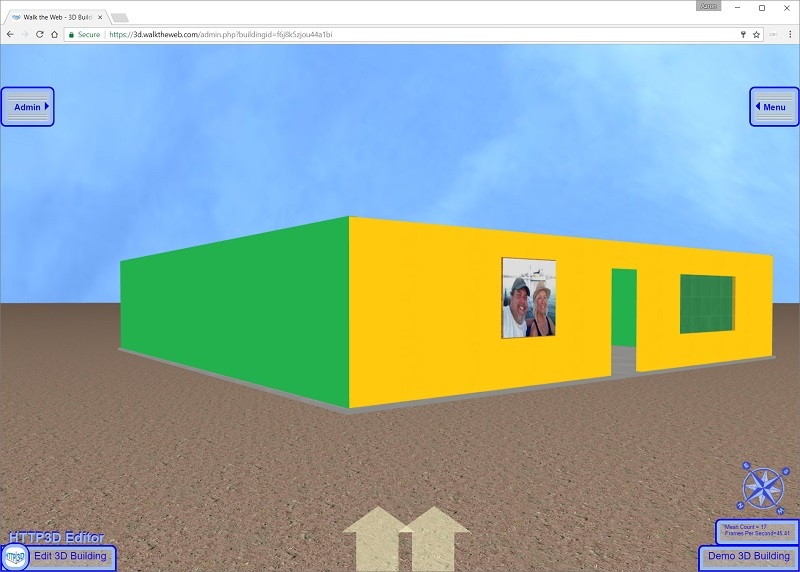 Using the 3D Building we are creating in the demo, use your mouse and Right-Click the front Wall (one we put the door and window on). Shape Visibility Distance is the Load Zone selector. Change the front Wall setting to High – Load when far. Face the corner of the 3D Building so that you can see two Walls at the same time. You are in the Normal Load Zone. Now use the Mouse Scroll Wheel or Down Arrow on the Keyboard to move backwards. When you move outside the Normal Load Zone, you will see all 3D Building Blocks disappear except the one we set to High Load Zone (and the Foundation which is also set to High by default). Now move towards the 3D Building, you will see the 3D Building Blocks reappear. 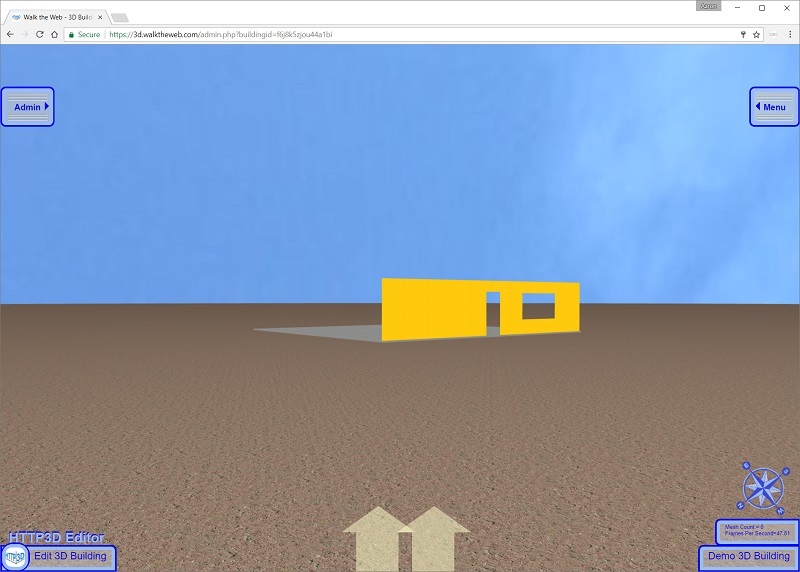 Next, in order to have even more control of when 3D Objects load, try Custom Load Zones.